A roadside car mechanic in Bolton loves his job so much that he has taken to collecting miniature models of recovery trucks and emergency vehicles. Carl Robinson has around 2,000 models in his collection, which he began when he entered the motor trade industry 12 years ago. The 33-year-old has scoured online auction sites, shops and car boot sales to amass his collection that now spills from boxes throughout his house, The Bolton News reported. A car mechanic is used to getting insurance for fleets of cars - a motor trade insurance policy provides protection for the vehicles that a car repair business stores on its premises, while a road risks insurance policy will enable the mechanics to drive the customers' cars. 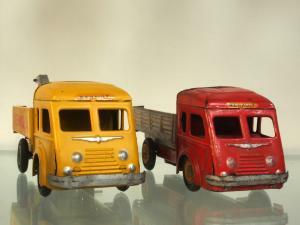 And with the model trucks holding such value in Mr Robinson's life, he might wish to insure them on his own personal policy. The roadside mechanic, who works for John Macadam and Son, explained his hobby: "I started collecting the models 12 years ago and once I had one particular model found myself looking for something similar and it grew from there really. I don’t drink, I don’t smoke, so why not? "I’m based in Chorley awaiting recovery call outs, so sometimes while waiting I will sit in the back of the van and do some work on them. I have even sourced the colours of Macadam trucks and have painted some to match." Mr Robinson says he hopes his two sons will share his passion for the models, but added: "They can look at them by all means, but they’re not to play with."